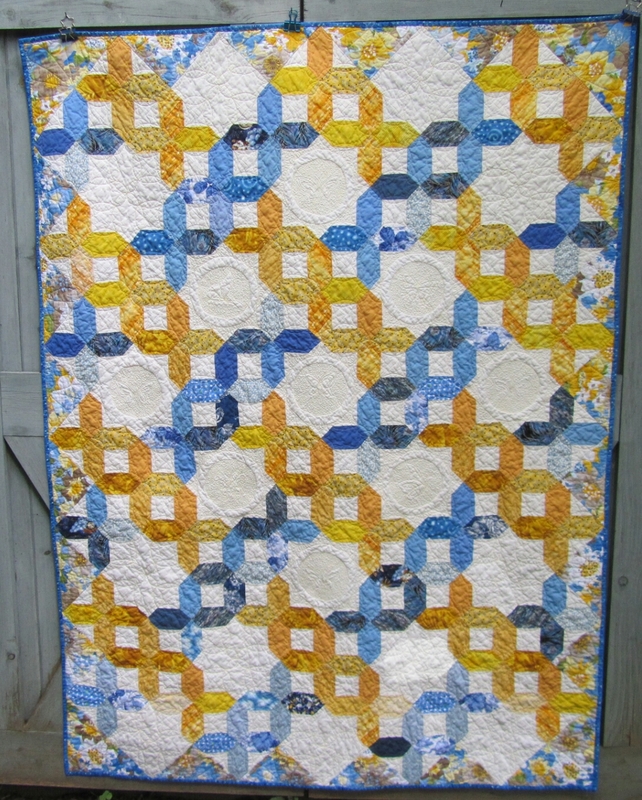 Blue and Gold Scrap Trellis is Finished! Yes, I have finished it! This is my first leaders and enders project, the little 3.5″ units pieced as I put together various other projects. Did I like it? Well…it did make for very neat, tailless piecing on the other tops. I liked that a lot. It was hard to train myself to do it religiously, and I could only go so far with it and still concentrate on the other work. But, yes, I will do it again, with a simpler project of mindless squares. I made this quilt to use the backing fabric in my stash (French Country Journal by Michael Miller). I’d been saving it for a while, and it is just too pretty to cut. And there will always be more fabric. So I decided to use it, and designed this quilt. 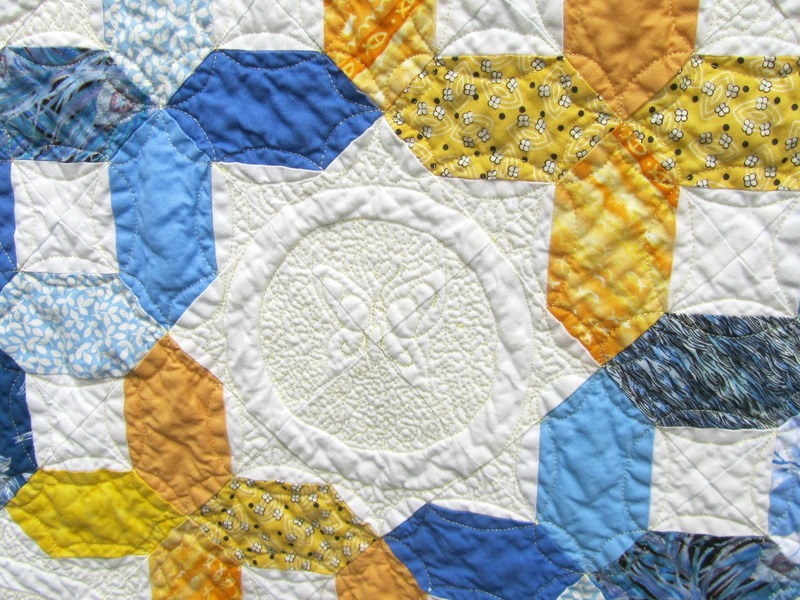 It’s inspired by a quilt in Scraps, Inc. I haven’t seen the book, but I liked a project that Pam made, so I designed this in EQ7 to resemble a trellis. 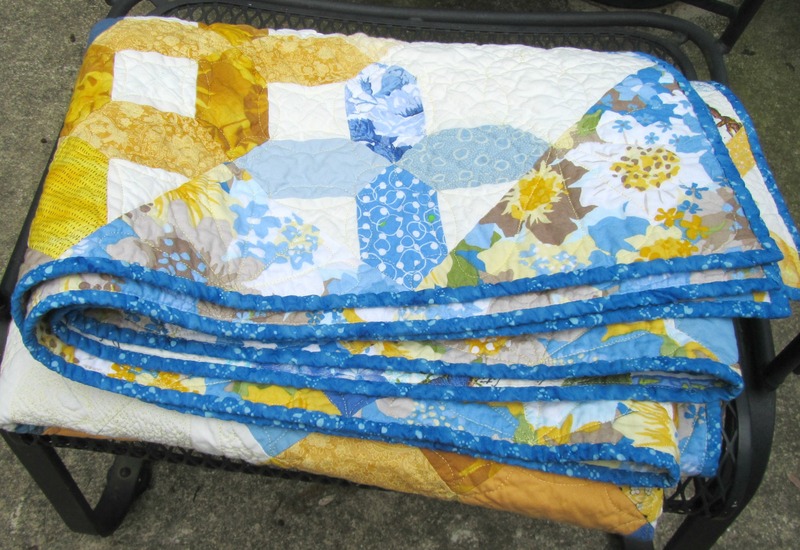 I used all the yellow, gold,and blue 3.5″ squares in my bin, and sewed 2″ white squares to two corners to create the little lozenges. This was an odd shape. I bought fabric at Missouri Quilt Company for borders, but decided against them. I added another two rows at the bottom, removed the side and corner setting triangles, and substituted the floral fabric (potential border fabric). This finishes it a bit without being heavy. I like it. It’s 51″ x 69″ I quilted it all with yellow Sulky on top and white Bottom Line on the back. Most of it is done in an orange peel motif [probably never again after all the terrible puns (redundant?) on Twitter!]. Those are butterflies in the centers of some of the white areas. I would do them differently another time, but they are not bad. This doesn’t have a purpose yet. It may go into my Etsy shop, except that I really like it a lot. But I only need so many quilts. Hope you had a finish this week. I’m linking up with Finish it up Friday and WIPs Be Gone. This is so sweet. Love the blue, orange combo and the trellis. 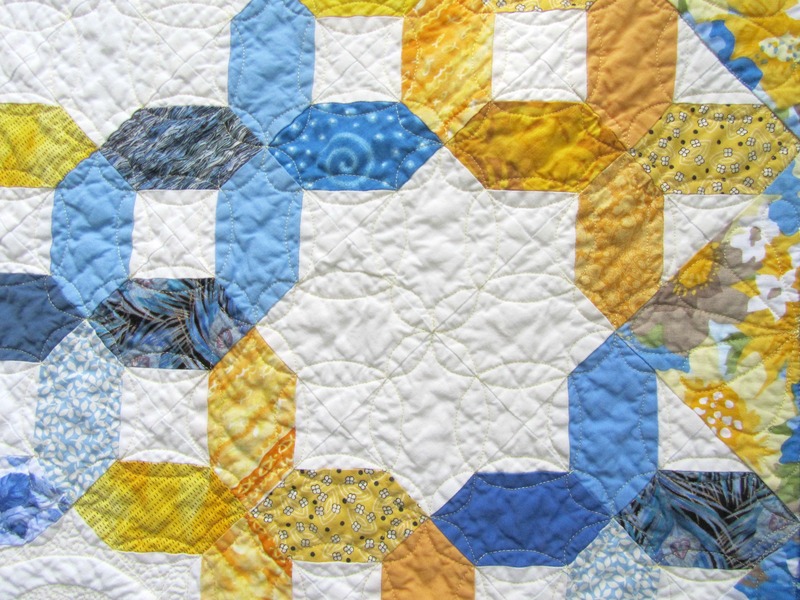 Good idea on the borders, and nice quilting. Yay! This is a beautiful quilt And I love the quilting in the white area! Seems real intricate. This is beautiful, Valerie. Keep it, keep it, keep it. Lol! You did a great job! I love this quilt. That lozenge shape has been on my mind as well and you may see a blog post about it. 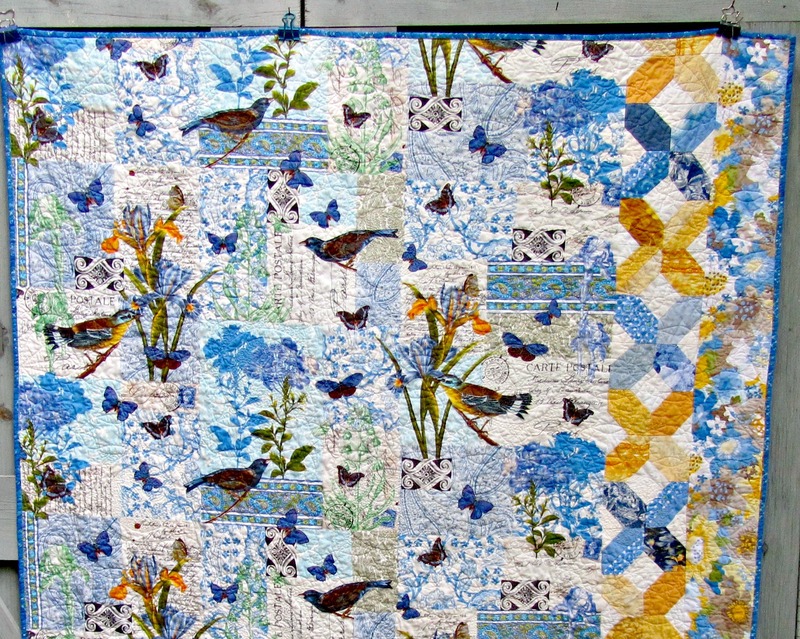 Have you seen the pattern from Missouri Star Quilt company called Goodnight, Irene? It was in a recent issue of their magazine and is very similar to your quilt, though opposite: the lozenges in Goodnight, Irene are the negative space. I also have that Michael Miller fabric. I love it also and it wouldn’t be the same cut up. I have a lot of it and if it doesn’t become a dress, it will become a back. I am glad you tried out leaders and enders. It is important to have a mindless aspect to the patches you are using as leaders and enders. I get to a point where I move the leaders and enders to the main project and find something else that is mindless for the L&E. Getting so much done and not wasting thread is a huge bonus. 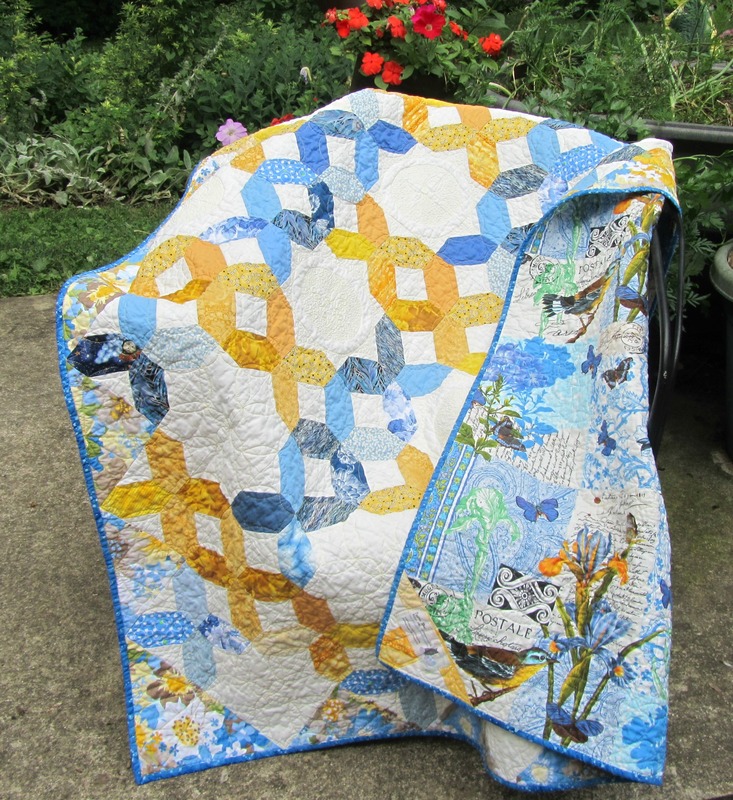 Beautiful quilt, backing is just so divine!